Is there a way to gift these e cookbooks to someone else as a Christmas gift? Is there any way to buy the books without having to sign up for PayPal? It takes my credit card details but then insists I create a PayPal account before processing further. I’m working on adding credit card payments Ken, it’s taking a bit longer than I hoped but working through it! I use paypal, and I have never joined their credit card company. I just use my regular computer designated card.. I do not understand what the bundle is. Do u have a timeframe when credit card payments will be possible? Ok txs. Looking forward 2 it. Your cookbooks look amazing. However, I’ve tried to buy them multiple times by my PayPal account isn’t letting. I’ve never had this problem and am able to use with other vendors with no problem. Do you have any idea what’s going on? Just wanted to say ‘fabulous’! I’ve been following some of your recipes and have recently bought your e-cookery book – comfort foods. Love what you are doing and happy to provide advocacy. I’m excited to try these recipes!! Do you have any suggestions for an almond flour replacement? I’m allergic to nuts. Thanks! Good evening. I have tried multiple times from several devices to order this amazing looking book. However, after selecting my payment option in PayPal, it will not allow me to do anything else. I am very frustrated as I missed the pre-sale as well. Please let me know what I can do to resolve this as we really want this book. Thank you for your time. The price is 11.99$ but when I go to pay is 18.99$??? Hi Maribel! That’s only for the special priced bundle with the Summer edition, if you click no thanks it will take you to the $11.99 payment 😉 xo!! Hello, I just bought the recipe book, how long does it take to receive the email? I bought it two hours ago. You should’ve received a download link from SendOwl to your PayPal email right away (sometimes goes to spam). I’ll resend now 😉 xo! Hi Paola, have just purchased your new ebook. Can’t wait to get going and try all those yummy recipes. Summer book is a hit..icecream a favourite in our house. Whilst ebook are great can’t bet a colourful cookbook like your presentations. Please do printed versions..make good presents to my family and friends. Glad you do measurements for us in UK and everywhere else downunder! However your icecream recipe still has a13oz can of coconut milk in it . Should be 400mls! You are doing a great job, Bless you. Ethne thanks so much for your comment happy to hear you enjoyed the summer one so much! And yup I’m a book person too, so working on self-publishing this one next year (and those of you who have bought the ebook will only pay the difference). xo! Question. I have posted in the last couple of months at least 3 or 4 times. I have never seen my posts or any responses. Any idea what’s happening? Btw, they didn’t end up in my spam. Thanks, hoping this on gets through! Hi Laurie! I’m so sorry this happened to you (we had a spamming issue this summer and tightened up security… and completely my bad that about 400 comments from you guys went to spam! 🙈 I’ve been sorting through them this week and answering the ones that are still relevant. xo! and thank you so much for your support! Paola, so glad to hear that you are working on a paperback. I purchased and thought I downloaded correctly but it won’t open. REALLY looking forward to the other version! No need to make this comment public, it is just for your info. I love your ecookbooks! For some reason the ePub ones have an overlap going on. One is on a line near the top (prep time, cook time, and so on) and one is on a line near the bottom (Fat grams, Protein, carbs). It makes the numbers difficult to read. Help! This doesn’t occur in the PDF’s. My first time on your website! Beautiful! Already shared you with several keto friends. And just bought your 2 eCookbooks, my first time doing such. Being not so savvy, I accidentally x’d out of the page where I was downloading the ePub and PDF options, I had 1 to go. Can’t seem to get it back. 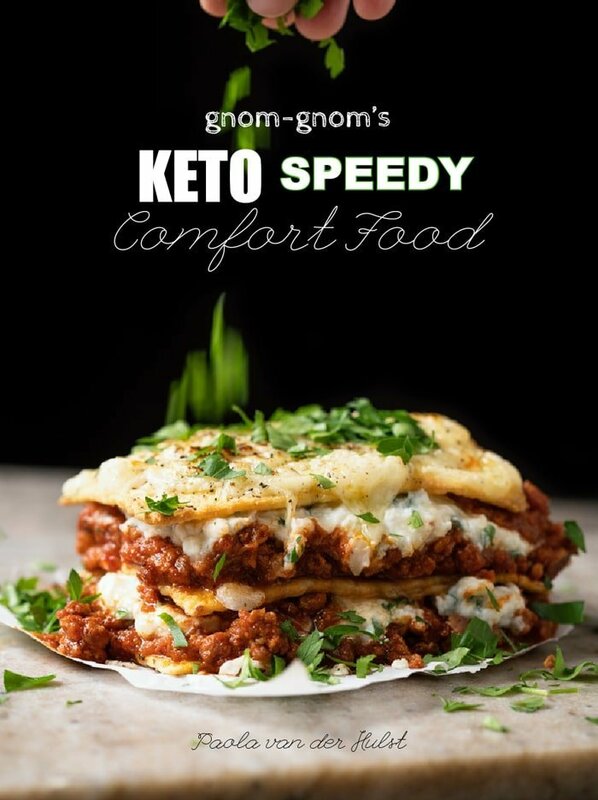 I’d like the Keto Speedy in a PDF file (as well as ePub), is there a way ya’ll can get this to me? Please? Thank you!!! I love how you have re-created the art of baking, btw! Bobbye Jo! I feel so honored thank you so much for your support! Would you mid shooting me an email to info@gnom-gnom.com so I send you your copies?! xo!! Thank you for all your hard work in creating keto recipes to share with others. Hi, just purchased but I also am interested in a paperback version. My tablet is useless with space, always telling me I have none. Anyway, I guess I am old school, love physical books. LOVE your recipes, looking forward to the development of the paperback version! Thanks for all the yumminess, it’s been a real game changer for the last couple of months. I love your site and all the great recipes. I do not have a PayPal account, so I am patiently waiting for the time I can buy your e-cookbooks. Thank you for all your great work! Love your recipes, can’t wait to try all these new ones! Just wanted to give you a heads-up that the redirect to PayPal doesn’t seem to be working on the mobile version of your website. I purchased both the comfort and summer cookbooks, but can not find a prompt to download either. Where is the download link? I’m having an issue where it’s like the buy now link is dead! I have tried it several times. I have made only a couple of your online recipes and I have loved them, so I decided to buy your ebook. I tried getting the Summer book too but my AUD is not doing so good at the moment, and my PayPal balance was not enough 🙁 So I had to miss that one. Is there a page on your website for substitutions? Like in the Nutella recipe it says to use Avocado Oil, can it be substituted for Coconut Oil? I wonder too about other ingredients in the recipes… hence my question. is there a paperback copy for purchase? Not yet- but so many of you have been asking for it so def looking into it (we do know that if you bought the ebook, you would just pay the difference if it does come to life) xo! I have the same question. I purchased both books yesterday and, after looking at the beautiful photography, I realize that I need print copies! Perhaps that self-publishing option through Amazon could work. Awesome to hear Aly thank you! And yup, Amazon self-publishing is one option- I’ll be sure to let you guys know once we’ve figured it out (and again, for those of you that already bought the ebooks, you would just pay the difference) 😘! I am trying to purchase and download your new ebook Comfort Foods but as soon as I press BUY NOW and it takes me to Checkout I cannot progress any further. Could you please check for me if there is anything stopping it from getting any further with the purchase. I already have your Summer ebook which I love. Thanks for all you do for us. Hi Carla! Since you already have the summer cookbook, after pressing ‘BUY NOW’ you will click ‘No Thanks’ for the Summer ebook offer and it should then take you to pay the $9.99 of this one. Please do let me know if it is not working (I removed your email from your comment for privacy reasons, but will shoot you one as well!). So happy to hear you enjoyed the Summer one so much- it’s my absolute pleasure! xo! Do I have to pay for the eCookbook by Pay pal? Do you accept a credit card? I have enjoyed your recipes, thanks for your hard work to make yummy keto nom noms! Unfortunately for the time being yes as I’m based out of Mex City (we’re setting up business in the LA now, so more fun things are coming and credit card payments are a sure thing!). Xo and super happy to hear you’ve been enjoying the recipes! Just got my copy, I can’t wait to look through it! Paola it’s BEAUTIFUL!!! I may have drooled all over my ipad lol! Dying to try the pancakes too!! I have a feeling the pancakes are going to be a big hit 😂! Thank you Jennifer and enjoy!! xo! HOORAY PAOLA!! Cannot wait to make the pancakes, bless you! !